Description: The third in Thomas W. Strong’s “Dime Caricatures” series of antisecessionist prints published early in 1861. 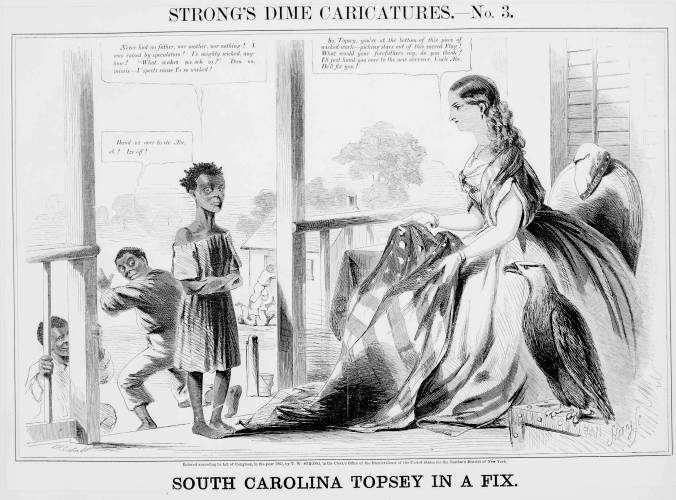 Here Topsy, the impish slave child in Harriet Beecher Stowe’s “Uncle Tom’s Cabin,” personifies the secessionist state South Carolina. An elegantly dressed lady, Columbia, is based on Stowe’s Miss Ophelia, the New England spinster who attempted the moral education of the child. Topsy appears repentant at the steps of a porch before Columbia, who sits on a chair with an American flag on her lap and a liberty cap behind her. On the floor beside her is a bald eagle. Columbia shows the flag to Topsy, displaying the holes in its blue field. She scolds her, “So, Topsey, you’re at the bottom of this piece of wicked work–picking stars out of the sacred Flag! What would your forefathers say, do you think? I’ll just hand you over to the new overseer, Uncle Abe [i.e., President-elect Abraham Lincoln]. Behind her another slave turns to run down the steps exclaiming, “Hand us over to ole Abe, eh? Ize off!” Several more slaves watch or clown about in the yard beyond.